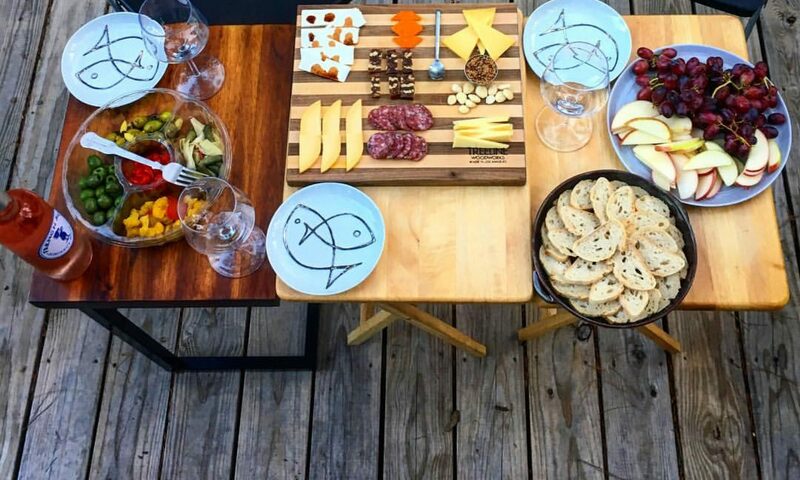 In traditional Southern cuisine, dinner on New Years Day is filled with foods that symbolically set the table for prosperity in the coming year. 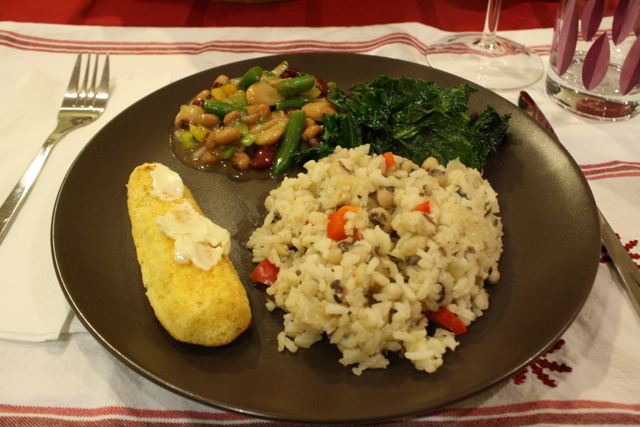 Dinner on New Years Day includes black eyed peas (representing coins), greens (representing cash), and cornbread (which represents gold). Not wanting to miss out on some good luck, I made Hoppin’ John, sautéed kale, and cornbread for dinner. I don’t know if it will bring riches for the coming year, but it was definitely a great dinner to share with friends. 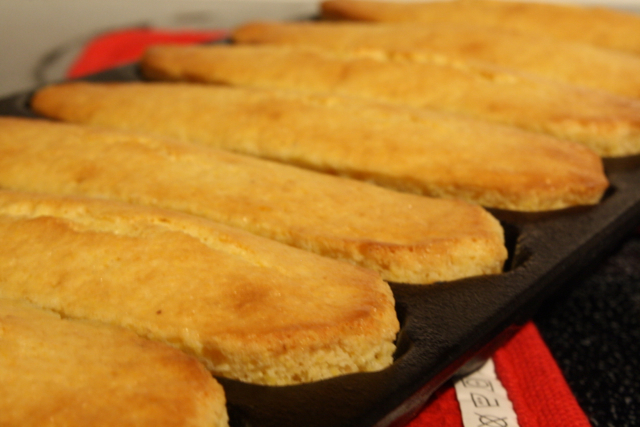 To bring us gold, I made cornbread. 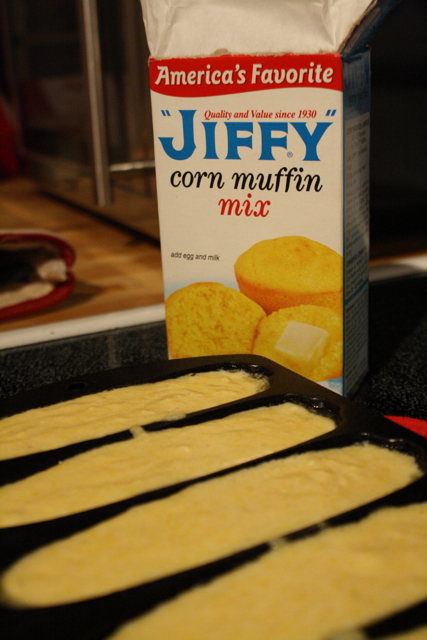 I actually cheated to save time and made Jiffy cornbread from a box, but cooked it in a cast iron cornbread pan. To bring us cash, I made kale sautéed with garlic. This quick and simple recipe results in delicious greens that are neither bitter nor mushy. Heat about a tablespoon of olive oil in a skillet and add sliced garlic. Let the garlic flavor infuse the oil. As the garlic starts to turn a light golden brown, toss in a bunch of kale (stems removed and leaves sliced into approximately two-inch squares). With a pair of tongs, turn the kale several times until it starts to wilt. 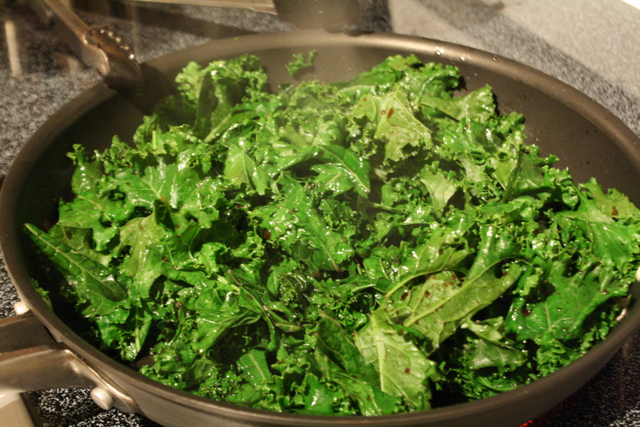 Add a light drizzle of red wine to the skillet and let the kale steam for a minute. Season with salt and pepper and remove while the kale still has a little bit of crunch left. To bring us coins in the coming year, I made my version of Hoppin’ John. For my take on Hoppin’ John, add two cups of uncooked white rice to four cups of boiling chicken stock. Simmer on low heat for about 20 minutes, or until all of the stock is absorbed. 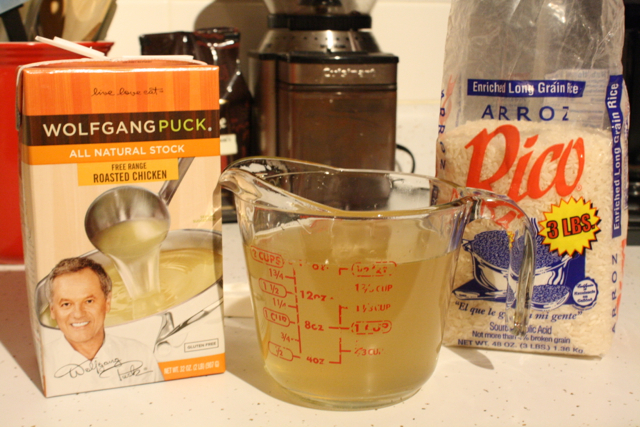 Using stock instead of water makes the rice taste a lot richer (and we are certainly going for richer with this meal) and helps develop the flavors of the dish better. Slice four chicken sausages into 1/4 in wide coins and sauté in a skillet with olive oil over medium heat until the edges of the sausages start to get crispy. To the skillet, add a small diced onion, a diced red bell pepper, and a minced clove of garlic. Sauté until the onion is soft and translucent. Add about 12 ounces of black eyed peas (I used fresh black eyed peas, but using dried peas that have been soaking overnight should work fine too). 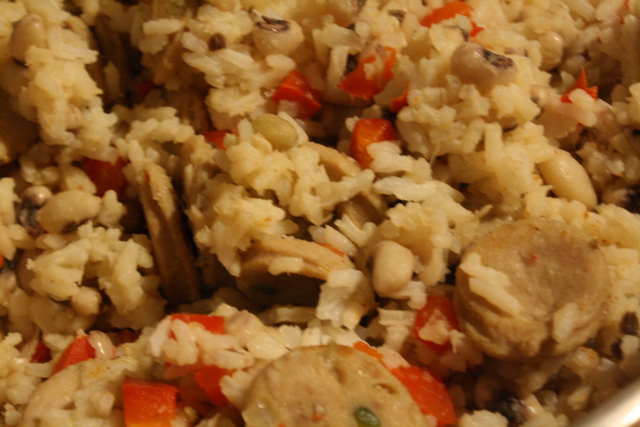 Stir the ingredients together and spoon in the rice, mixing well between each spoonful. Season the Hoppin’ John to taste with salt, cracked black pepper, and ground red pepper. Kyle and Shannon joined us, bringing a bean salad with black eyed peas for added fortune. With gold, cash, and coins represented on the plate, we enjoyed something much more valuable than money — the opportunity to share dinner and fellowship with great friends. 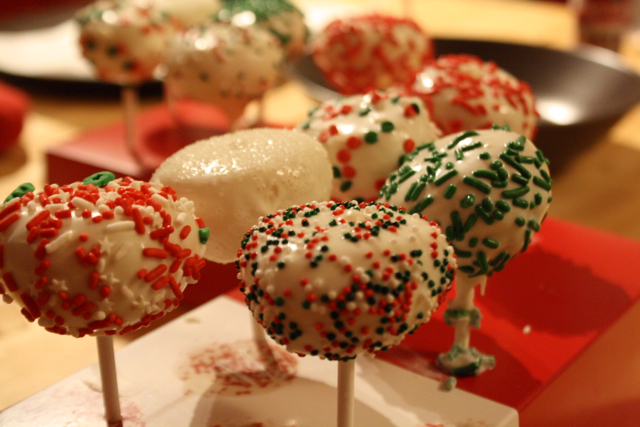 Although they have no obvious symbolic meaning, we rounded dinner off with some cake ball pops that Jill and Shannon made.